The Winter months in Rocky offer plenty of great wildlife sightings, with many encounters occuring just outside the car window. If you like Discovery Channel or BBC nature specials you will absolutely love a Wildlife Tour. Beyond looking for and observing animals, we'll talk about their behavior, ecology, adaptations to survive the winter, and other really cool details. Winter Wildlife Tours involve a good bit of driving throughout the park, making many stops along the way, and generally only a few minor walks as we explore the park for animals. 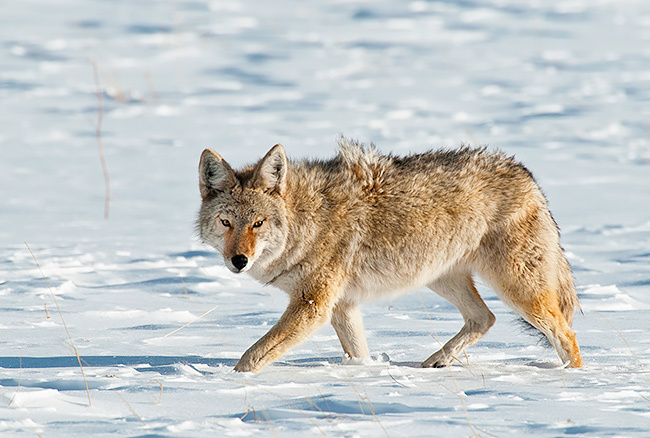 On an average winter day we will find Elk, Mule Deer, Pine Squirrels, Wild Turkey, and more than half of our winter days we also find Coyotes and Big Horn Sheep ewes and lambs and the occassion great sighting of Rams. 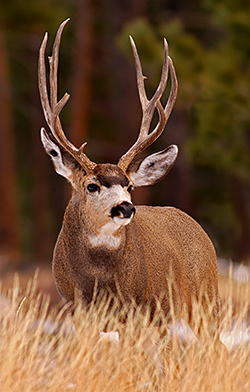 November is prime time for the Mule Deer rut, Coyotes and Elk are very active and it snows very little. With some luck we can also find Big Horn Sheep. Late November and early December is the Big Horn Sheep rut with rams smashing into each other at 35 mph, and if you're lucky you can hear the echo of their collisions over a mile away. The New Year brings more snow and investigating animal tracks made by snowshoe hares, bobcats, elk, deer, sheep, mice, pine squirrels, birds, and coyote can be great fun. Each track tells the story of survival in the snow. 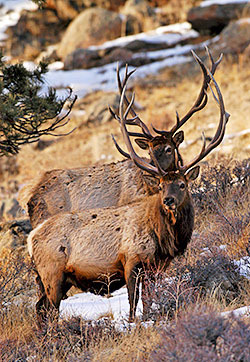 Wildlife is still readily seen, especially the elk, coyotes, and deer. Late February through April is prime time for big horn sheep as the female and lamb bands come down to the lower hills almost everyday. 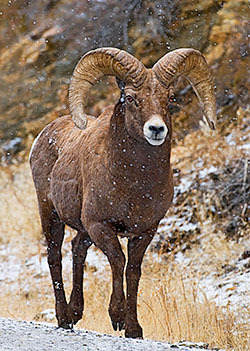 If your lucky the big horn rams will show up as well. March is the beginning of Spring and some years we are lucky to find nesting Great Horned Owls, Big Horn Sheep ewe bands become more visible, coyotes are hunting in the meadows and close the end of March the hibernating animals like ground squirrels, chipmunks, and marmots start waking up. 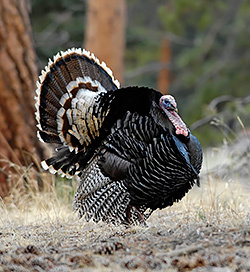 March is also Spring Gobbling season and we often see Wild Turkey flocks and sometimes fanning males. Around mid-March all of the Elk and Mule Deer have lost their antlers and in April they start shedding their heavy winter coats. Winter is also a great time to see the various bird species that spend winter with us, nothing warms your cold toes like the song of a flock of Mountain Chickadees. The scavenging birds like Magpies, Stellar's Jays, Clark's Nutcrackers, Crows, and Ravens are all out showing just how smart they really are surviving the winter and having fun in the snow. Tour Details: All tours are private, only the people you invite will come along. Groups are limited to four people to ensure each person has a quality experience with our naturalist. Limited to children 12 and up. If your kids are under 16 please read the Safari FAQ to make sure this tour is for your family. Binoculars are available for each person as well as use of a spotting scope to really bring those distant creatures into view. There are a number of stops where we can use the park restrooms. Sunscreen, water and snacks are provided for all guests. Be sure to dress warm and in layers. Avoid cotton socks and jeans as they absorb water. Warm people see more animals. *Not included: Park entrance fees are $25 per day or $35 for a 7 day pass.